During my recent adventures with alcohol inks I enjoyed creating abstract panels. Some of them I turned into backgrounds or scenes by adding stamps and die cuts but others I left alone because I liked the pattern and colours just as they were. The one above reminds me of a geological cross section. There is an example of some type of cross section down the road from us and a few times a year I see a class of students on a field trip climbing around taking photos. The blues in the design above are particularly pretty in real life and there are threads of copper here and there also. This abstract reminds me of a waterfall but several people saw icebergs and crevices in it. Both these designs were done on yupo paper. I started as I often do by just dropping three colours of ink on the yupo; the sharp edges and lines were achieved by dragging the inks across the paper with a coffee stirrer. I don’t remember the ink colours I used other than the copper in the top one. First of all, the cards are stunning! Secondly, I’m thrilled you can leave them alone and not add anything to the cards, letting them stand on their own merit….which I totally agree with. I’m doing it more and more too and feel really good about it! Less is definitely more in many cases. Thanks Marilyn for your encouragement. I love the gorgeous patterns that appear with watercolours and alcohol inks. I don’t really create them the magic happens right before my eyes. I really like these two panels……especially the second one. I’ve used alcohol inks but haven’t come up with anything like you did. I tend to be too rigid and want to “fix” them. These are great! 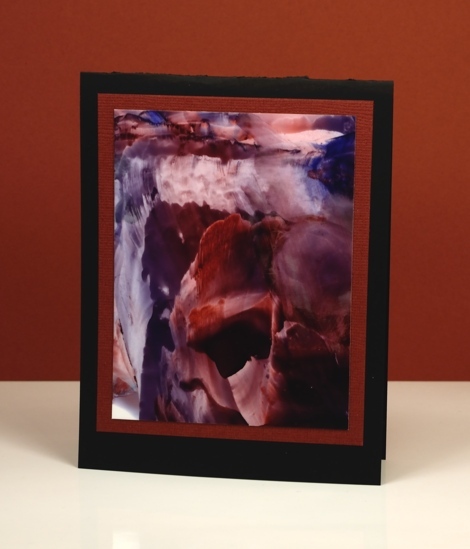 Have you tried Yupo paper? I bought some but haven’t tried it yet. These abstracts were done on yupo. It is very forgiving as the ink only sits on the surface. It is possible to make changes over and over. Thanks. Can’t wait to try this! I love this kind of thing that pictures form and reform. The 2nd one is especially 3-D. Well done! Thank you. 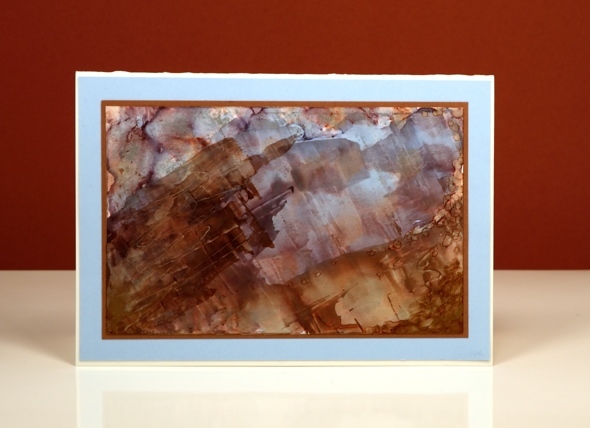 I love what you do with alcohol inks especially these abstract art pieces. Just stunning! Heather, are you using translucent Yupo or the white Yupo? Heather, I keep coming back to these to look at them over and over. They are amazing. Mine have never turned out like that. makes me want to try them again. And I’ve never used the browns, so now I have a reason to use them. Love your work!